So, the other day (Monday) I got my braces off. 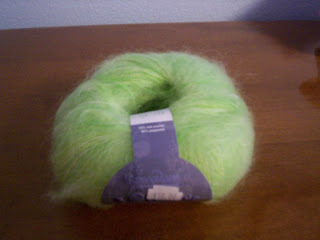 Then I went to Molehill Farm.....and I bought that yarn. Cascade Yarns' Sissi. I've got one skein, which is 327 yards. I know I want to make a scarf, but which one? I am thinking about the branching out scarf from knitty. Anyone have any other ideas? Of course, the decision won't be made for a while....I'm too busy working on a Secret Project. The person it's for may or may not read my blog, I don't know for sure. But a little mystery is a good thing, right? Also, my Dad's birthday was on Monday. I was going to knit him socks, but I only had one sock finished for his birthday. I promised him I'd finish the other one before cold weather hits. Sunday, I am off to Mexico for a week! See you when I get back!